We’ve all been there. You're on your way home from work, when you realize that you don't have anything to make for dinner. So you make a quick, at least that's what you think, stop at the grocery store and EVERYTHING looks delicious. Before you know it, your freezer is full of popsicles and you have more half-eaten bags of chips than you know what to do with. A great way to save a little time and money is to meal plan. Search for recipes that sound good or are easy to make and write out a shopping list. 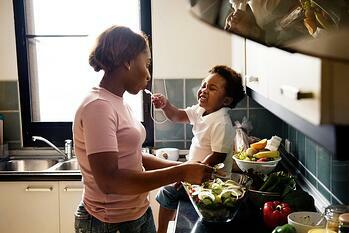 Get those living in your home involved with the planning by having them add their favorite meals to the plan. Before you know it, you’ll have a great file of go-to-meals that your household enjoys, making the planning process even easier. Having a detailed shopping list during your shopping trips will help cut down on the spontaneous purchases often made while aimlessly wandering the store. You can also eliminate those spur-of-the-moment excursions to the grocery store because you already have everything you’ll need for the week. Check your local grocery store’s weekly ad as you plan your menu to help find deals and give you ideas of what to make. Also, research what’s in season for fresh options that are a little less expensive. Meal plans are also great for those with a busy schedule because you can choose meals that are quick, easy, and work around your schedule. For example, if you know you won’t get home until late, maybe plan a crockpot dinner so there’s a hot meal waiting for everyone, regardless of their schedule. When you do make crockpot meals, double the recipe and freeze the extra for use later. You can also save any leftovers and either take them to work with you for lunch, eat for dinner on another evening, or use them in other meals, saving even more money and time.